I can't wait to be blown up, zapped, and treated like a laboratory guinea pig when Hearthstone debuts its next expansion, The Boomsday Project, on August 7. This 135-card set is full of weird science, all overseen by the infamous Dr. Boom and his crack team of researchers. It also features the first-ever Legendary spells, which promise some absurd effects (like Rogue's ability to immediately draw their entire deck). And while Legendary spells may get most of the attention, I'm actually most excited for the off-the-wall interactions made possible by the head scientists assigned to each class, like Druid's Flobbidinous Floop and Mage's Stargazer Luna. I recently got the chance to chat with Hearthstone's principal game designer Mike Donais and FX artist Hadidjah Chamberlin (who explains the Omega mechanic in the endearingly silly announcement trailer below, which doubles as a tribute to Bill Nye the Science Guy). In chatting about what to expect from The Boomsday Project, they revealed some fascinating insights into what goes into the design of Legendary spells and an amazingly clever detail regarding the exciting new Shaman Legendary minion, Electra Stormsurge. "We talked about doing Legendary spells for a long time," says Donais. "We did Legendary weapons because it made sense in Kobolds & Catacombs; we did quests because it made sense to do those in Un'Goro. It often came with the flavor of the expansion - and in this expansion, powerful, crazy science is happening. And that seemed to tie itself very well to Legendary spells. So it fit in both mechanically and flavor-wise." You can only use one copy of any Legendary card when building a deck, so by their nature, these Legendary spells have to make a major impact, as you've only got one shot with 'em. "They're kind of like the Old Gods, where they're such a big deal, and it's like 'Wow, you did a huge thing, that's awesome!'" explains Donais. "But not all of them. Most of them are very unique, they do something we haven't done before, or they do something that you would be surprised to see on a spell because it's so unusual." The aforementioned whole-deck-drawing card is Myra's Unstable Element, the Rogue Legendary spell that Chamberlin pegs as having the wildest visual effects. "All of them were tons of fun, because spells don't come with VO or specific characters to attach to them, so we get to do a little more storytelling in the effects for them," she explains. "With Legendary spells, you get to take that even one step further, so a lot of these were very much 'dial it up to 11.' And a lot of them also have really specific mechanical goals that we needed to communicate. It's always a fun balance getting to mix both the clear gameplay communication and the story of what's making that happen." Getting to watch the rest of deck crackle with pink electricity and riffle into the aether after you've drawn a full hand size of 10 cards also impacts the gameplay. "When we first playtested Myra's Unstable Element, before all the effects were in, it was drawing each of the cards one by one, and then playing the burn effect on them," says Donais. "And by the time it was done doing that, there wasn't really any time to play your turn; you had a full hand of 10 cards, so you really needed that time. So Hadidjah helped it work better for us," he laughs. But some of the effects are much more subtle, as is the case with Electra Stormsurge. In the video below, you can see her make a grand entrance at around the one-minute mark. "Electra Stormsurge's come-into-play is one that I'm personally really fond of, because it was so heavily influenced by audio," says Chamberlin. "By the time I was working on her effects, we already had her music and her VO. So when she comes into play and shouts 'Lighting can strike twice!' we have two lightning bolts that are actually synced up with her saying 'strike-twice.' A lot of those effects, where it's not just me - it's working with other people as well - I think we tend to get a lot of really cool creative ideas out of that, and it's just fun working with other people who are super excited about them." It's always great to hear stories about collaborative bits of brilliance like Electra's entrance, and it already seems like she's becoming a fan favorite thanks to her booming battlecry (both in style and gameplay effect). Here are some more behind-the-scenes design decisions and fun Hearthstone factoids from Donais and Chamberlin, some of which have implications beyond The Boomsday Project. Take a look, then get ready to experiment on your opponents - for science, of course - when the expansion launches in just a few weeks. After Death Knight hero cards made their mark in the Knights of the Frozen Throne expansion (and are still just as prevalent in the current meta), The Boomsday Project marks the first time we'll see hero cards featured in back-to-back sets. The Witchwood had Shaman's Hagatha, and now Warrior is getting a hero card version of Dr. Boom himself (though its effects are still under wraps). But that doesn't mean we'll be getting new hero cards guaranteed from here on out. "We don't intend to do one in every expansion," says Donais. "We did those ones because they made sense; we really wanted to tell the story about Hagatha and draw attention to her, since she was the cause of the Witchwood and all the things that were going on there. And similarly, Dr. Boom was the individual who was most important to this expansion, with his creation of his flying labs and mad science. But some expansions won't have one obvious one hero that we want to focus on, so I don't expect us to do this all the time. I think it's more like it just happened to work out." The Omega minions, which gain super-powerful bonuses when played while you're at 10 mana crystals, seem like they'd be incredibly broken for Druids, who can easily ramp up their mana supply long before other classes. But they'll only have access to the only Omega card that's been revealed at the time of this writing, Omega Defender. "There's actually only one neutral Omega card," explains Donais. "The other four are in classes, and they're not in Druid. So it's very specific." Consider that another bit of info: there are only five Omega minions in the whole set! Chamberlin points out that there aren't any set guidelines when designing a card's visual effects. "We don't have very many super hard-set cut-off times; a lot of it is by feel," she says. "Like, does this feel like the right amount of time for however big the thing that's happening is? How often is this going to happen? If something's going to be triggering all the time, then we use a shorter effect on it. "Echo was a pretty good example of that, where we cut out like 80% of the time it takes to spawn back into hand, just because players were going to be doing it so much. So we try to make sure that it hits the right balance between getting you back into the game as quickly as possible, and really creating that moment where you get to feel awesome. It's about balancing the needs of the game and the gameplay and the speed of the game with creating those really cool, exciting moments." Though it's recently fallen out of favor, Curious Glimmerroot is a very powerful Priest minion from the Journey to Un'Goro set. When played, it presents you with three cards and quickly shuffles them; if you choose the one that started in your opponent's deck, you get to keep a copy of it. And getting that shuffle animation just right was easier said than done. 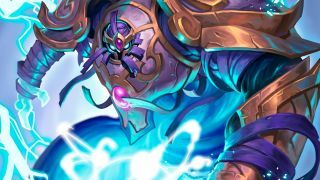 "We didn't actually have any of the tech to do that when we started, and Curious Glimmerroot's mechanic got finalized pretty late on," explains Chamberlin. "So it was like this three-week mad dash of Peter [Whalen], our engineer Josh Durica, and I throwing things back and forth to each other and making sure that everything communicated the right stuff, and was fast enough, and still felt like a shuffle but didn't take forever. Two of the cards were obviously fake, all of that. There was so much to communicate with that one, and so much tech that had to be put in place. It was definitely the trickiest, but it's still one of my favorites for that." "You don't even really notice that there's a bunch of new stuff going on, because it just feels right, and that's what the iteration did there," adds Donais. Chamberlin seems pleased when I tell her that I never clued into the fact that the Glimmerroot animation is always identical, despite having played it plenty in old Spiteful Summoner decks. "It's the same shuffle every time," she says. "Although it's not random - which order the cards wind up in is random, and that was actually a really important part of that shuffle. We didn't want people to feel like they could track which card had come from the hero, and then click that one and get it wrong. If you were trying to play and be really clever like that, and then get punished for it, that would feel terrible. So that shuffle was actually weirdly important to make feel kind of handwavy in that way," laughs Chamberlin. If you or someone you know is just starting out in Hearthstone, be sure to check out our guide to the best Hearthstone decks for beginners!